Released from the 2nd year on his weighty $200k contract with the Crew. Reports say that no fees (or allocation) were paid to either the Crew or Major League Soccer, which seems strange. The stance from the Crew seems to be that of a jaded boyfriend though ('she wasn't that good anyway' type stuff). From my perspective, he was not worth the $200k (I can argue that almost no MLS players are). Freeing that space up is more valuable but for it to have taken this long sets the team back. Ryan was drafted 9th overall. Last week I took a look at draftees over the past few seasons for MASSIVE REPORT and found that top 10 picks median is in the $65k range. I expect Ryan to be there as well. Another draft pick last week. Based on where Beckie was drafted I expect him to pull $44k and not count towards the salary cap number. From a Crew perspective the Duka trade with Chicago's Dominic Oduro seems all but done but I can't find a whole lot of interest from the Chicago side. 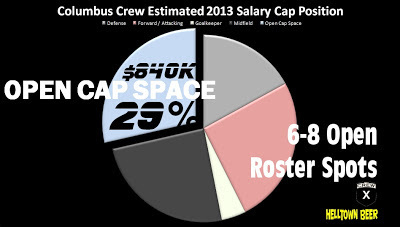 I know that Chicago is really looking to dominate the MF like they have in the past couple years and that Duka could fill a top 18 need but it seems like more of a 'thing' for Columbus more than the Fire. Again, like with Mirosevic, it is way too late to do this kind of thing. The draft should have been the drop dead date for this deal and even then it was too late. Duka staying with the Crew or not matters little to the overall salary cap hit. If the Crew trade for Oduro or not. The cap hit is likely around the $100k range. Ah. MLS. Gotta love all the non-value added change that ends up costing each club more than the actual deal. Go with it. Feel it - all you club "technical directors". Justify it. Make that move. YES. THE IMPORTANCE OF THIS MOVE. Actually, over at Massive Report I talked about not making that move. It might mean more to keep your "core" together, no matter the cost. Check it out.